A Gemsbok that showed its true colors! 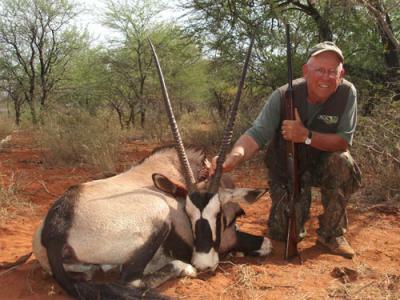 This African hunting story will give you a good idea of what may be expected from hunting a wounded Gemsbok in Africa! I was after an old broken horned Gemsbok that my wife had only clipped one lung on. A few hours (and miles) later, we finally found him crossing and open field about 400 yards in front of us. My PH said, "Quick, can you hit him anywhere from this far?" Now that was a long enough shot even off a bi-pod, let alone off standing stix. I was using a 338 Win Magnum with 210 gr Barnes TSX bullets so I was in no way under gunned, but a long ways away. Luckily I was able to hit his hind quarter and slow him up a bit more. He then went into the most terribly thick bush he could find. We had to crawl on our hands and knees just to get in under it at all. Suddenly my PH moved over and pointed ahead and said "SHOOT now". The Gemsbok was looking right at us at 10 yards, and I hit him square in the chest with the bullet going just past his nose. Now a 210 gr bullet at the range, generates 3,600 ft lbs of energy and it never fazed him. He just stood there with his Adrenaline keeping him up! What got his attention was the clink of the empty shell being ejected, and as I closed the bolt on the next round, here he comes with his head down fully intent on skewing me like a hot dog. I fired quickly from the hip at 4 yards and again took him right in the chest under his nose, and this time he pile up for good right in front of me. Whoa, that was too close for comfort. My PH was all bubbly and happy now, and I was too pooped to pop. I just sat down, and told him to go fetch the boys and the truck, as I would "guard" the trophy while he was gone. About an hour later, I could hear them arrive, and soon heard two chain saws started up, as they had to cut their way in. Soon enough they arrived with a camera and a water bottle. Now they could drag the Gemsbok out of there and load it up. Whoa, that was a fine story to relive around the fire with a cold one that night. So remember guys... Gemsbok will fight back! Its good you did not panic, Gemsbok are very dangerous when wounded. Terry, I really like your stories, please keep on going to Africa and give us more. A GREAT STORY OF A HUNT FOR A TOUGH AND BEAUTIFUL ANIMAL. GREAT TROPHY! A good Hunting Story. Apparently, in Africa, even Plains Game can be dangerous. THAT WAS A CLOSE CALL. I HEARD THAT GEMSBOK ARE ONE OF THE TOUGHEST ANIMALS IN AFRICA. BODDINGTON HAS WRITTEN OF THE TENACITY OF THE GEMSBOK. GOOD JOB IN STICKING WITH IT TO MAKE THE KILL.